Having enriched with antibiotics and anti-oxidant and smoothed taste and aroma the new product made by complete natural methods, the product is to be sold under Eravital brand in Turkey. 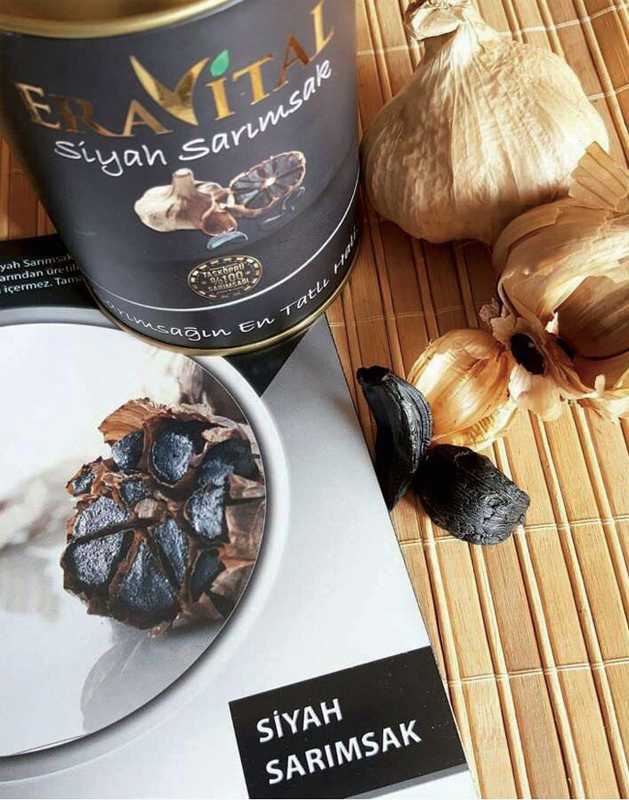 We talked with Ozgur Yilmazel of Eravital Company about the new product black garlic. Yilmazel emphasized on the fact that it is made by fermentation of fresh garlic and can be consumed with sugary, sweets and chocolate. First, will you mention about the foundation of your firm? EB entrepreneurship incentive. The early results showed that tastes are totally identical. It was a hard process as no one knew about the product, and its dark color was also another issue. We ended up finding out that the product is known as super food in USA, and a popular one in England, Spain, Greece and in Far East. We’re now trying to promote it in our country. It is interesting that this product is sold as cola drink and in sweet forms. It has a caramelized unique taste resembling both sweet and salty, also know as umami taste. Therefore, it’s used mostly in gourmet cuisines. It goes best with dishes made of red meat. This processed form is more concentrated and has more antibiotics and than fresh garlic and more antioxidants than pomegranates. The process, actually, is not fermentation but a reaction called Maillard. It is made from white garlics by storing under variable high temp and temperature and humidity for three months. It turns black and loses both its volume and bitter aroma. There are many studies showing the benefits of the product; it increases immunity, regulates blood pressure and protects against heart problems. It is also widely used against diabetic patients. The most beautiful side is that it can be consumed as raw and has no bad odor. What kind of reaction is the process? It is some kind of fermentation. First garlics are selected and calibrated and finally their roots and stems are cut off after that the calibrated and cleaned fresh garlics are placed into fermentation room for heat and humidity treatments. Then they are taken out and left for drying for about two weeks. Finally they are packaged in various sizes. Growing garlic is a seasonal operation. It is planted at the end of September and harvested in May. Normally, the product can be stored at +3 C degrees. Do you use the black garlic in other forms? We made a jam of black garlic which has a very unique taste similar to grape molasses. Also black garlic extract and black garlic paste is among our products. We are also producing White garlic powder. What is your target, domestic market or exports? 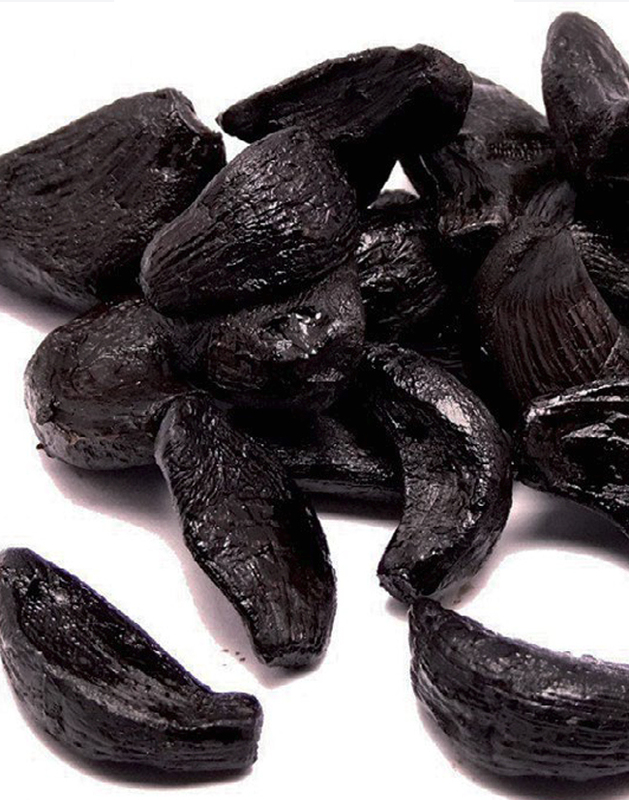 According to us, exporting black garlic is easier, As the consumers in abroad are familiar with this product. There are several prospective buyers in Europe. Our samples were approved in UK and Germany. In domestic market we are selling to major names in spice seller markets, such as Biostore and the shops in Grand Bazaar, Currently we are also placed our Product in File Market shelved which is a subsidiary of BIM Group. Soon we are hoping to be a supplier of other market chains. How large is your production capacity? What is your occupancy rate? Presently our monthly capacity is about 4 to 5 tons. We use about 70 % of our capacity. Processing technology is made by our staff. I have to say that our products are free of alcohol. And we are aiming to get Halal certification. What about your intentions and targets for the future? e try to introduce this product to domestic market and then start to export. 82% percent of garlic is produced in China. The garlic farmed in Turkey is of higher quality, but this fact is not well know yet. Black Garlic can be sold at up to 100 Euro per kilo. In Spain giant producers having 20 to 30 thousand sqm factories plant their own freh garlic. Black garlic was first introduced in the world in 2004 by Scott Kim and widespread in a short period. It’s produced in great volumes in the USA. Recently, we have found out that this product was made centuries ago in Anatloia. Fresh garlics were buried under earth and a fire was lit on it. The buried garlics were kept under these conditions up to 1.5 years. What the most important about black garlic is that İt can be consumed by chewing and has more antibiotics and antioxidants than frsh garlic. Ingestion of garlic by chewing (or crushed garlic) can reduce cholesterol, triglyceride, MDA, systolic and diastolic blood pressure even in the presence of increasing fat intake. But undamaged garlic (swallowed) had no significant effects. it is because of inability of Alliin to convert to Allicin. Our products now can be also purchase internationally on Platforms such as Ebay and Etsy. When do you plan your export activities? We have deep talks with buyers in England who demanded peeled black garlic and in puree form from us. Our samples are approved. Hopefully, we will be exporting about one to two tons of product monthly. Our plan is to increase our capacity five fold at minimum. We are aiming to add value to our country and ur infamous Taskopru Garlic.